Aldehydes and ketones can be converted into amines, through the formation of an imine and treatment with a reducing agent. Reductive amination is a method that converts aldehydes and ketones into primary, secondary, and tertiary amines. The most effective reducing agent for this reaction is sodium cyanoborohydride (NaBH3CN). The hydride reagent is a derivative of sodium borohydride (NaBH4), formed by replacing one H atom by CN. Sodium borohydride cannot be used because would reduce the ketone before it is converted into an imine. 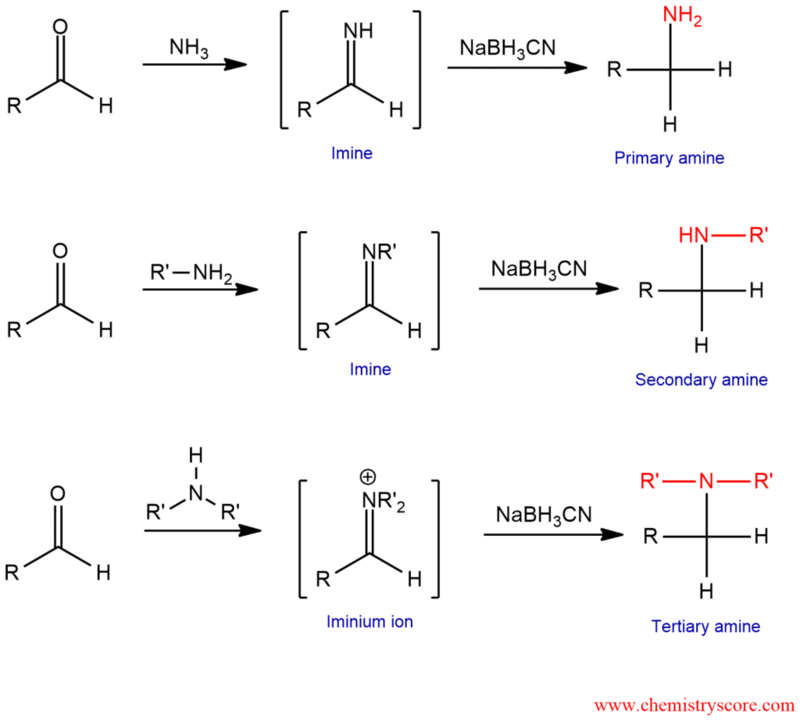 And sodium cyanoborohydride does not react with ketones but will reduce an iminium ion (a protonated imine). In this process, the carbonyl compound is exposed to an amine containing at least one nitrogen-hydrogen bond and a reducing agent such as NaBH3CN to furnish a new alkylated amine directly. The new carbon-nitrogen bond is formed to the carbonyl carbon of the aldehyde or ketone. Reductive amination replaces a carbon-oxygen double bond by a carbon-hydrogen and carbon-nitrogen bonds. Reduction of the imine forms an amine. 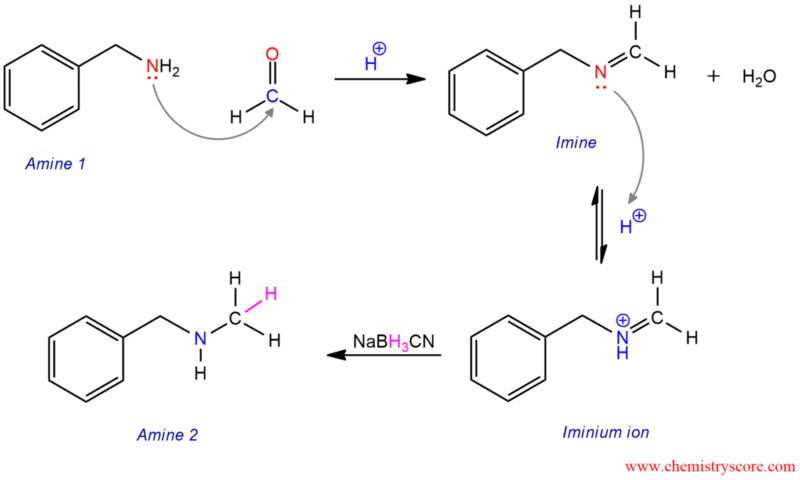 The mechanism of reductive amination consists of three steps. The first step is the formation of an imine by attacks of nitrogen (amine) to the carbonyl carbon of formaldehyde. In the next step, the resulting imine will be protonated under acidic conditions to give iminium ion (its conjugate acid). And in the last step, in the presence of reducing agent, the iminium ion will be reduced to give a new amine.